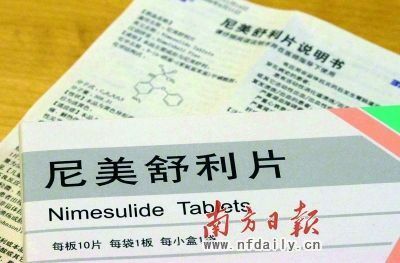 The State Food and Drug Administration issued a circular on May 20 banning the use of Nimesulide, a non-steroidal anti-inflammatory drug, for children 12 and under, citing the dangers of potential side effects such as liver and kidney damage. Nimesulide first became available in Italy in 1985. It is now used in more than 50 countries and regions all over the world. The drug entered the Chinese market in 1997. According to the SFDA, while common non-steroidal anti-inflammatory adverse reactions to the drug include vomiting and stomachaches, domestic and overseas statistics indicate that more severe issues are related to the drug, such as allergy, blood coagulation disorders, decreased white blood cells, and damage to the liver and kidney. Previously, the SFDA only prevented the use of the drug among children 1 and under. The SFDA also ordered a suspension of the production, sales and use of Duxil (or almitrine and raubasine compound) for its "unobvious effect." Clinical research found little evidence proving that Duxil effectively improves cognitive ability in patients suffering vascular cognitive impairment, the SFDA said. The drug was supposed to treat symptoms related to cognition and sensory nerve damage. The two bans come after a two-month nationwide campaign was launched earlier this month to probe the quality of essential drugs and ensure drug safety. The National Center for Adverse Drug Reaction Monitoring received 692,904 reports of adverse reactions in 2010, up 8.4 percent compared with those in 2009. Among them, 109,991 cases involved new or severe adverse reactions, up 16.2 percent from the year before.